Press Release posted 1/4/17 – The Sierra Madre Police Department would like to recognize the efforts of the Sierra Madre Police Officers Association for participating in the #PINKPATCHPROJECT. 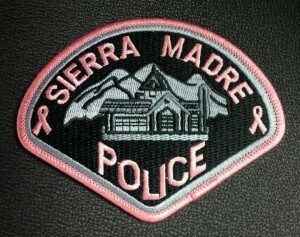 The SMPOA advanced the funds to purchase the SMPD’s pink shoulder patches and Pink Patch T-shirts that were sold at various venues and events throughout the City. Due to overwhelming support from the community the SMPOA was able to hand deliver a check to the City of Hope for $2,400.00 to assist in the fight against cancer. The spirit of the City of Sierra Madre shines once again!